After ordering three pre-dreadnought battleships and modifying them into very early examples of all-big-gun warships, the Brazlian Navy stopped construction on them in early 1907. The Royal Navy’s new Dreadnought had rendered them obsolete, and Brazil had to have something at least as powerful as the new British ship. Work halted on the Brazilian battleships on 7 January 1907; on 20 February the Brazilians approved the new design and signed a contract. The ships became much larger and now carried a dozen 12-inch guns in place of their 10-inch main battery. They also became much more expensive; the new contract stipulated that two ships would be re-started to the new design, while the third would be laid down as soon as the first was complete. Minas Geraes started over in April and Sao Paulo in September. Whether the ships represented an increase in fighting power over Dreadnought was debated even at the time, and definitely seems questionable now. They were indeed larger (19,200 tons and 543 feet long for the Brazilian ships vs. 18,100 tons and 527 feet for Dreadnought). The Brazilian design had greater firepower, with 12 guns to 10, with 10 firiing on a Brazilian broadside and eight on a British one. Both were rated for the same relatively high speed, 21 knots, but the British ship had much better protection, with an armor belt of 11 inches against 9 inches in the Brazilian ships. Even so, Britain’s Director of Naval Construction was unhappy with Dreadnought’s armor scheme and hoped for thicker plating on future battleships. Minas Geraes passes the high Level Bridge at Newcastle, on her way to final fitting-out. The new Brazilian design suffered from not truly being original: The builders had been instructed to make use of the materials already collected for the earlier battleship design. Thus the new ships were doomed to carry the same thickness of belt armor as the ships first ordered, small pre-dreadnoughts based on the Chilean Constitucion (later the British Swiftsure). Construction moved along rapidly, but a ship-fitter’s strike stopped work on both for the first half of 1908. Armstrong’s launched Minas Geraes in September 1908, but Sao Paulo did not slide down the ways at Vickers until the following April. The British shipbuilders blamed the Brazilians for slowness in approving progress, and suspected that an inability to pay for the ships lay behind a deliberate stall. In the fall of 1908 commodity prices for coffee and rubber began to slide under pressure from African and Asian competition, respectively. An attempt for float a new loan for 15 million sterling failed, and Brazil risked default on her battleships. Her financiers, the Rothschild’s banking house, suggested selling one of the battleships to the Royal Navy. Armstrong’s signalled agreement if the Brazilians used the proceeds to fund construction of the promised third battleship. The “Navy Scare” of 1909, marked by Unionist demands in Parliament for eight rather than four dreadnoughts in the new naval bill, seemed to make the time right for a sale. The Liberals had cut one battleship each from the Bellerophon class of 1906 and the Collingwood class of 1907, and two from the Neptune class of 1908. Buying the two Brazilian ships would immediately make good the 1906 and 1907 losses. Armstrong’s board of directors, however, feared that a sale to the Royal Navy would get Brazil out of the dreadnought market entirely or worse, send her to another shipyard for replacements. They apparently used their influence to convince the British Admiralty that the battleships were not suitable for the Royal Navy, pointing out their origins as enlarged versions of the greatly disliked Triumph-class pre-dreadnoughts. The campaign proved a triumph of perception manipulation, pressing the image of the ships as the world’s most powerful yet at the same time claiming them not good enough for British service. Thus despite a desire to sell, and a political situation ripe for a quick sale at an inflated price, the Brazilians ended up keeping their unwanted ships. Minas Geraes joined the Brazilian fleet in January 1910 and her sister arrived in July. The international naval press gave the Brazilians all the positive coverage for which they had hoped. “Never has the Navy of a minor power,” opined the British journal The Navy League Annual, “ loomed so large on the international horizon as that of Brazil during the past year.” Building dreadnoughts, in the eyes of commentators, even outweighed Japan’s naval victory over the Russians five years earlier. Sao Paulo is launched. 19 April 1909. The satisfaction wouldn’t last long. On the evening of 22 November, mutinies broke out on both battleships while at their usual base in Rio de Janeiro. Seeds had been sown during Sao Paulo’s delivery voyage from England. The dreadnought stopped at Lisbon, Portugal, to take President Hermes de Fonseca on board for the journey to Brazil. While the battleship was in port a radical rebellion sent Portuguese King Manuel into hiding. Suspecting their sovereign had taken refuge on the huge warship, rebel army officers demanded and received permission to search the ship. They did not find the king, but the incident undermined the authority of the ship’s officers and exposed the crew to radical agitation. The new ships required much larger crews than previous Brazilian warships, 900 men each. Their captains tried to work them into shape with extraordinarily harsh discipline, and that treatment combined with the Brazilian Navy’s low pay scale and poor rations led to widespread discontent. When a sailor on Minas Geraes was severely flogged for a minor infraction, the crew rose in anger led by petty officer Joao Candido. They killed the captain and several of his officers, and on Candido’s orders threw all the ship’s liquor stores overboard. The British civilian shipyard employees still aboard both battleships were locked in their cabins. The red flag quickly rose on her sister Sao Paulo, the old coast defense ship Marshal Deodoro, and the new scout cruiser Bahia. Crews of several torpedo boats refused to join; the battleships opened fire on them and they fled the scene. The four rebel warships then steamed up and down the bay, performing squadron evolutions much more crisply than had ever been the case under their officers. Intimidated, the government yielded to the mutineers’ demands. All received amnesty, though about a thousand sailors were discharged from service. A new code of criminal conduct was issued, and the government promised to spend the money allocated for new dreadnoughts on improving shore facilities and living conditions for sailors. Though Armstrong’s did not yet know it, the Brazilian naval program was dead. The government began quietly seeking to dispose of its two battleships but would not be successful. Sao Paulo crawls toward New York, 1918. Brazil declared war on the Central Powers in October 1917. Both battleships had deteriorated badly in just eight years, and before Brazilian desires to send them to join the Grand Fleet could be realized they required major overhauls. Sao Paulo needed 42 days to travel from Bahia to New York, and only made it with large-scale assistance from the American pre-dradnought Nebraska, which sent 90 of her engine-room gang aboard the Brazilian ship and escorted her the entire distance. Fourteen of 18 boilers failed during the trek, and Sao Paulo needed two years’ worth of repairs before returning to Brazil. Afterwards, Minas Geraes followed — having been the site of yet another mutiny, in September 1919. The war was long over before even the first of the battleships was declared fit for service. Led by a junior officer, Hercolino Cascardo, Sao Paulo’s crew raised the red banner again in November 1924. This time Minas Geraes did not join the rebellion, and the two battleships confronted one another. Sao Paulo fired a single shot at Minas Geraes, wounding the ship’s cook, and bombarded several of the harbor forts. Sao Paulo headed south, and her condensers promptly broke down — less than five years after her total overhaul. Making only nine knots, she limped into Montevideo, Uruguay, where most of the crew went ashore and asked for asylum. The Uruguayans turned the ship over to Minas Geraes a day later. Cascardo later received a pardon and rose to the rank of fleet admiral. Sao Paulo later in her career. Minas Geraes was converted to burn oil during a 1931–35 reconstruction. Sao Paulo’s condition would not allow a similar change, but she was modernized less thoroughly between 1934 and 1937. During the Second World War the battleships proved nearly useless, being relegated to harbor defense roles. Sao Paulo was scrapped in 1951 and her sister in 1953. The battleships had wasted Brazilian resources for over forty years, having contributed to rebellions but little else. Both ships appear in Cone of Fire, both in their fairly powerful Great War at Sea configuration and as floating targets for Second World War at Sea. Their weak protection makes them vulnerable even when new; by the time more powerful battleships or aircraft are available, they are practically defenseless. 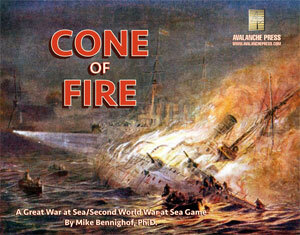 Click here to order Cone of Fire!